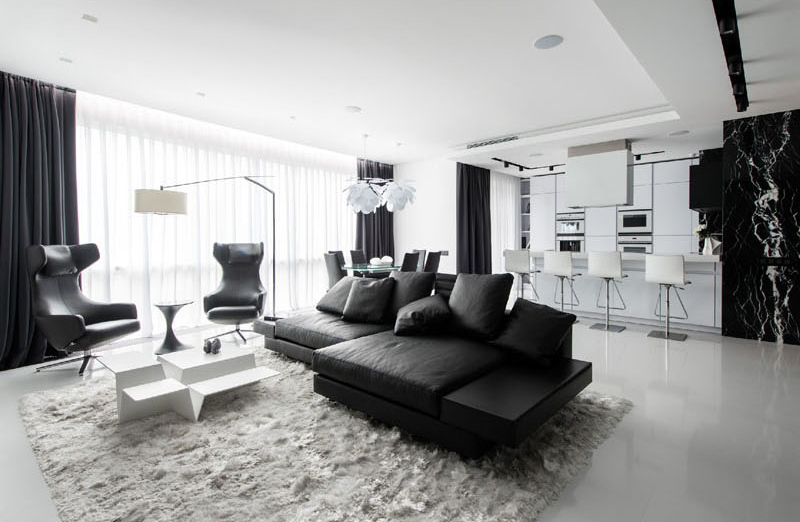 If you think black and white is boring, this apartment interior will change your mind! While most of us are worrying about the colors we would use in our home’s interior, others stick to what is safe. Black and white colors are a safe combination and works well in any space. Same with other neutral colors but it appears that black and white is the favorite of designers. We won’t wonder why because the combination looks great without overdoing anything and yes, you can find so many black and white items too that you can add to your home as a decor. Others would bring a pop of little colors in it just to bring some life and bold accents to it. 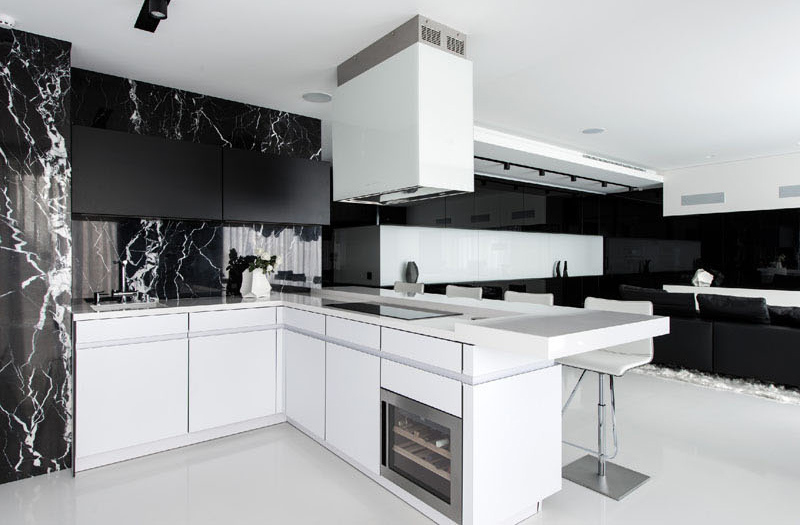 Today, we are going to show you an apartment that is black and white in the interior. Although this isn’t the first black and white space that you will see, this apartment will make you appreciate the combination even more. 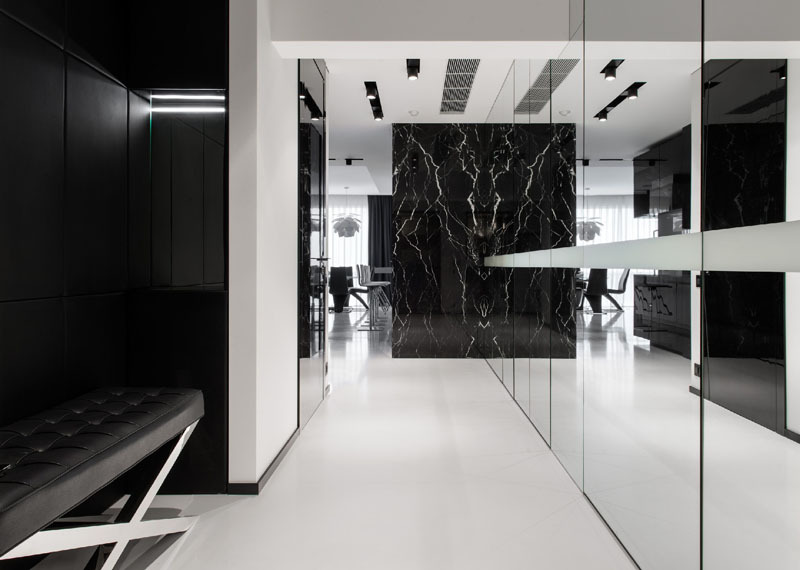 Totally black and white interiors are not something that we see too often but this apartment in Moscow by Geometrix Design used those colors in it. You will be amazed that almost everything in this apartment is black and white but in some areas, they added a little pop of color as well. Apart from the color, the choice of furniture and decors is also good that when they are put together, it resulted into a beautiful home interior. Let us take a look at the apartment below. Unique feature: An apartment with black and white interior and modern design. 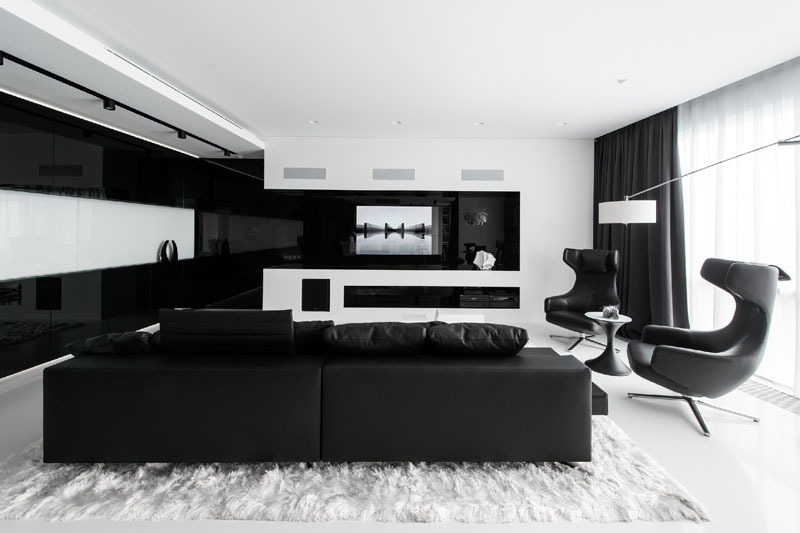 The interior of this apartment is all black and white. You might even think that this is a colored photo but was just made black and white with its color but you are wrong. This is indeed how the interior looks like! Aside from the modern furniture, one can also see a built-in television behind the black glass, and when the TV is off, the whole wall looks black and white as if there is not TV there. Along the walls of the interior are black glass shelving units. But it also has white part which is serving as a decorative background. Looking great, right? The living room as well as the dining room and kitchen share the same space. 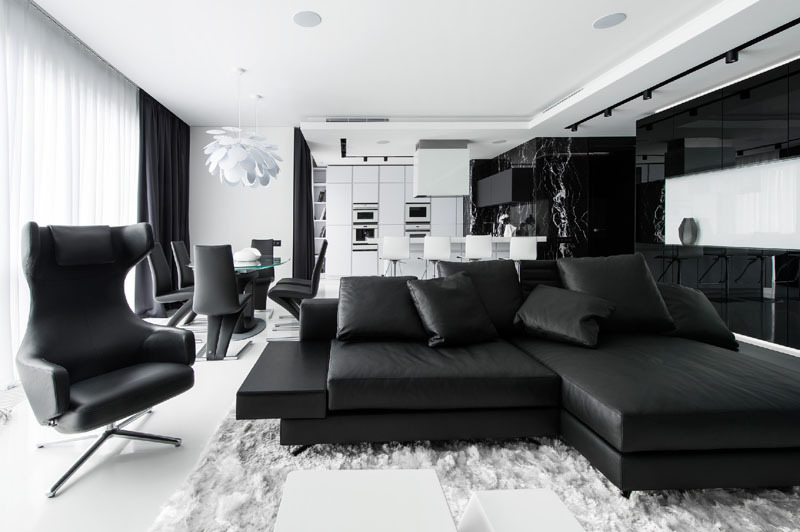 You can see that the area has many contrasting colors in it but what really attracts one’s eye is the black modern sofa. Behind the living room, one can find the kitchen. 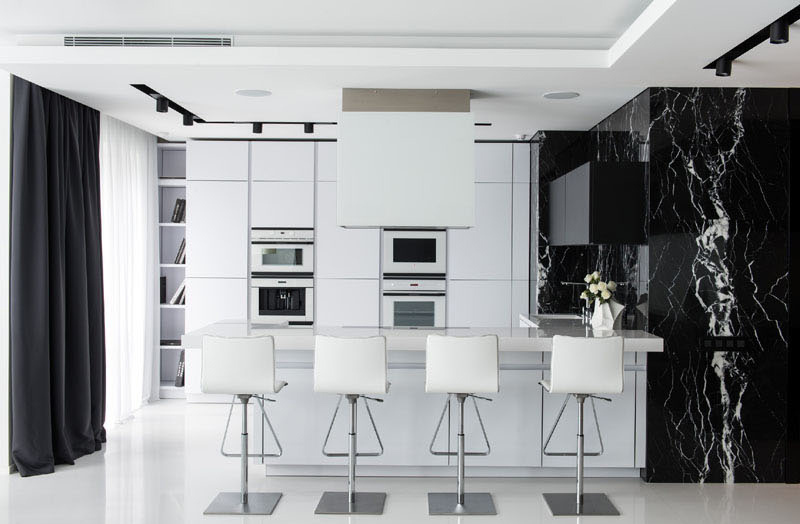 Contrasting the black used throughout the living room is he white colors that is mostly used in the kitchen. Black marble and black curtain is also utilized to continue the black and white theme in the interior. The kitchen cabinets are all white which is a good contrast to the black walls in the area. It also looks very neat to work with white countertop too. To the side of the kitchen, one can find the dining area that has sculptural white pendant lights hanging above a glass topped dining table and elegant black chairs. Isn’t this a nice place to dine in? For the home’s hallway, there is a wall of mirrored glass that reflects light, makes the space appear larger, and it also hides additional storage as well. There is one wall in the bedroom that is entirely covered in custom-designed leather panels that act as a headboard and doubles as a decorative feature for the room. Bright yellow chairs to bring a pop of color in the area and it have been used to draw your eye to the window. In the home office, it used dark flooring and furniture which contrasts the white walls and ceiling. The natural black marble is also separated by blue lighting which adds a small pop of color to the area. 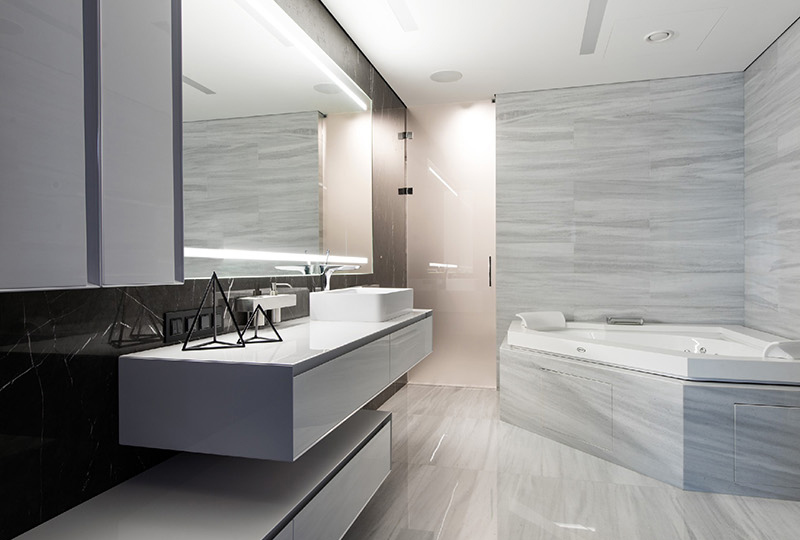 In the bathroom, a lighter stone tile has been utilized around the shower, and a pearly glass entryway isolates the toilet from the primary lavatory. There is also a shower, which utilizes the darker marble as a shower encompass. This apartment will make us realize that black and white isn’t ugly at all. It actually looks really nice and easy to the eyes even if it appears that the images above are classic photos because the absence of color. But not all areas are merely black and white since some parts have a little pop of color just like in the bedroom and there are also areas where they played with colored lights. This apartment is a project from Geometrix Design managed to give the rear part of the home a beautiful and unique design. This is something that other designers can also apply to their own homes as well. And as you can see, even the interior of the house is well designed to give the homeowners a cozy and comfortable living. What can you say?